I first started going to Dr. Warren many years ago. In the past year, after a major loss in our family, severe pain in my body, exhaustion and the battle with weight loss/gain, i went into his office for a consultation and was told about IV therapy. After the first course of vitamin c and other supplements, my energy, thinking ability, rest and lessened pain were noticeable almost immediately and lasted for quite some time. Later, I returned for another IV and learned about the detox program. For the first time in memory, I was able to get control of what I was eating, the pain in my joints is almost completely gone and I certainly lost weight and feet amazing. I refer people as often as possible for lasting help. Laura’s knowledge of nutrition is an instant source of information and assistance concerning supplements and diet. Vibrant Life Oklahoma has such a great team in place. Dr. Warren and Laura are so passionate and knowledgeable about improving health. IV Therapy, supplementation and nutrition are helping me feel so much better. They create a safe environment in their office or home and so flexible to work around my schedule. I feel very cared for and blessed as a patient and very thankful for their compassion and sacrificial service in a holistic approach. Dr. Warren has been instrumental in making my father comfortable. He was diagnosed with stage 4-bone cancer March 3rd. We live in the middle of 200 acres and Dr. Warren makes the house call 3 times a week. My dad feels so much better. We can’t thank him enough. Dr. Warren and his wife Laura are like family to me. They saved my life and I couldn’t be more grateful that they are apart of my journey. Before I met Dr. Warren I was a hopeless, malnourished, drug addict with no direction or a way out, headed towards a painful death. I met Dr. Warren and Laura and he started giving me IV therapy treatment in the comfort of my own home. He helped me through the withdrawals and cravings by treating me with a variety of vitamins and supplements along with the IV treatment. I wouldn’t be alive today if it wasn’t for the help and support of Vibrant Life. They go above and beyond to help their patients, which is why I recommend them to everyone I come in contact with. Not only did they give me hope and a way out of my addiction, they also took the time to help give me direction and purpose. That in the end changed my life forever! I owe my life to these two and am grateful for all the things they have taught me about nutrition and how to overall be successful in life. Dr. Warren has been instrumental in my recovery. Not just the treatment but the information he has provided as well has helped tremendously. I respect his opinion and expertise. I like the fact that he is knowledgeable with things that are not “normally’ done in a typical doctors office. He truly wants to help in every aspect and not just collect some money or send you to surgery. I feel my healing time has been cut down drastically because of Dr. Warren. Thank you. Dr. James Warren and his wife/office manager Laura are two of the compassionate and caring people one could ever meet. They genuinely care about their patient’s health and overall wellbeing. They truly embrace the healing process of mind, body, and spirit. I was on the brink of death, basically facing hospice and end of life. Through IV therapy, supplements, and diet changes I am glad to say that I no longer face that looming “Your going to die” “There is nothing else we (general Healthcare providers) can do for you” diagnosis. I was blessed to have them both come into my life at just the right time. I would highly recommend this option when traditional medicine is doing more harm than good. It is truly a life style change that will change your world for the better. Doctor Warren and Laura have been such an answer to prayer. I was struggling with high blood pressure, weight gain, food addiction and on the road to some major health issues. They have explained so much on taking vitamins to eating healthier, not just here do this or take that. But I understand why I need vitamin C and so much more. The knowledge that I received to help make the road to a healthier life has been phenomenal. Dr. Warren and his wife, Laura, are two of the most compassionate people we have ever met. They listen to what our daughter has to say about her health and wellbeing, and address all of our concerns. We are so glad to have found Vibrant Life Oklahoma because it has greatly improved the health of our chronically ill daughter! I have had various IV therapies (such as Glutathione, Vitamin C, magnesium, ferritin) at the Vibrant Health Clinic and have always felt well supported by both Dr. Warren and his wife, during these treatments, which have made a significant difference in my health. They are very cost competitive in their pricing, as well and I sincerely appreciate that. All in all, I’ve always had excellent experiences at this clinic – great thanks to them both! I Love Dr. Warren & Laura Warren! They saved my daughter’s life with IV therapy, supplements and lot’s of Love and compassion! The timing of them coming into our lives was perfect timing! She was very malnourished and her body was literally starving to death due to an addiction! Many a day Dr. Warren and some times Laura (when she could get away from the office) would come to visit my daughter and administer IV therapy and lots of unconditional love! They went over and above. As well giving her lots of wisdom concerning her addictions! My daughter is now healthy and free from her addiction!! She has a second chance at Life and that makes my heart so happy!! I am forever grateful! The Warrens also are now treating my husband and I with Glutathione (a preventive nutrient) IV Therapy. It does wonders for your body and is known as a great antioxidant. We are very active and want to continue to feel young! Dr. Warren is as well giving me prolotherapy treatments which is helping my spine tremendously… I have had several injuries and surgeries on my spine (ex collegiate gymnast). I cannot say enough good things about the Warren’s and how grateful I am they are in my Life!! My experience with Vibrant Life has been nothing short of a miracle. I have had constant pain from injuries and toxin that are job-related. Dr. Warren has assessed my situation and through a series of treatment I am pain-free and my health is percent. My blood pressure is great and I have better health now than I have been in 20 years. I was also amazed at how one treatment made such a difference. Vibrant life has an excellent staff that is very knowledgeable. Dr. Warren doesn’t just treat symptoms; he identifies and corrects the problem with a whole life treatment of overall wellness. I cannot stress enough how grateful I am for making my quality of life outstanding! Dr. Warren has been a blessing. He is very knowledgeable, personable, and flexible with my schedule. Focusing on whole wellness, I have seen major improvements in my health. Would highly recommend to anyone. One of the most caring and compassionate doctors I have ever met. I will always think so highly on time spent with Dr. Warren and the treatments that he has performed (organized to perform) on me. He has very much helped get my life back. Cannot say enough. So thankful I saw their ad on Facebook last year! Not only are they amazing people, but with one vitamin c IV, my toddler son saw his eczema clear when diet wasn’t enough. I also went to Dr. Warren for help with my anxiety. I was a MESS. After a few days on the list of supplements he gave me, I felt like a new person. I finally saw the light at the end of the tunnel. So thankful for this place!! Dr. Warren and his wife Laura are two of the most genuine people you will ever meet. They have helped me reach physical goals and overcome several health issues that I have been fighting most of my life. They are very knowledgeable and they are totally there to help you. I love how dedicated they are to their vision of healing holistically and the journey of life health. I love Dr. Warren. He helped my daughter when no other would. She had a vaccine injury from HPV and he did vitamin C and Glutathione protocol infusions. It helped her body heal. I love him and his family. I have been a patient of Dr. James Warren for 14 years. While I was in a STRENUOUS and physically demanding training program for my occupation I suffered an injury. I scheduled my first appointment with Dr. Warren because of his sports related experience. I have continued my office visits throughout these past years to maintain my level of physical condition and wellbeing. Adjustments, B12 injections, IV therapy, nutritional guidance, and supplements are some of the services Dr. Warren and his wife Laura have provided with a level of caring, compassion and genuine concern. I have personally recommended friends, family, and coworkers and will continue to do so. A few months ago, I thought I was holding my 28-year-old daughter for the last hours of time she had left. Her body was full of toxins and her liver no longer wanted to do its job and a hospital had sent us home. The words they used still ring in my ears. She wasn’t ready to give up and neither was I, so through prayer, I received the answer in a most unlikely way and left a message at Dr. Warren’s office at 5:00am. GOD was truly working in our lives when Dr. Warren returned my call at 8:02am. His willingness to begin treatments was HOPE. Dr. Warren is not a walking textbook of protocols; instead he has a gift of listening and receiving information about his patient and knowing what the body needs to recover. The benefits of her treatments were more than physical and she continues to become stronger. The time spent at appointments healed us as a family too. Dr. Warren and his wife Laura provided and continue to exhibit their unwavering belief in recovery; mind, body, and soul. I am grateful that Dr. Warren knew her body could regenerate if it was given the correct nutrients and she could control how her body felt with wise food choices. He taught me so much during the process. An addiction depletes the body of its resources so making good decisions becomes harder, so when you are able to restore the body’s ability to fight, the brain makes the transition too. I am so grateful to Dr. Warren for believing she was worth saving! Dr. Warren is always there when you need him and will work around your schedule. He explains every treatment – which makes me much more comfortable. I also like that I can receive treatment in my own home! Myself, along with my family are beyond fortunate to have found Doctor Warren. Doctor Warren and his wife, Laura are an amazing team that provide services that are incomparable. A great place to meet all of your health care needs. Laura and Dr. Warren are phenomenal people that really care about you and your health! Dr. Warren and his wife Laura are amazing! I have seen so many life changing results from patients they have helped! This man right here, Dr James Warren is changing Kayla’s life. 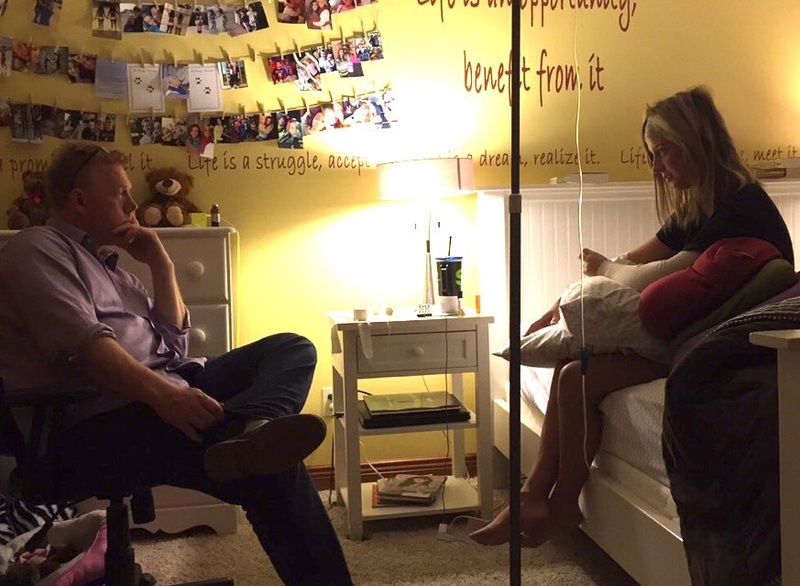 He flies back and forth from Oklahoma to treat her Gardasil injury. Right now, things are tougher than normal because of her chelation process. The heavy metals are being forced out of her body. She is swollen and covered in a blistering rash. Her pain is intense and scary. She’s such a fighter and I admire her courage more than she’ll ever know! Dr. Warren is the most unselfish, caring, tenderhearted, loving, compassionate, witty, brilliant and soft spoken man that I have ever met. He has touched our lives in so many ways. Thank you Lord for blessing us with this amazing man. He’ll return on Thursday with his beautiful wife, Laura to continue Kayla’s treatment until she is strong enough to travel to his home where she’ll stay! We love you Kayla…. KEEP FIGHTING! -Jeni R.
Katie uses Vitamin IVs along with other service Vibrant Life Oklahoma offers to prepare her for marathons she runs. Christy and Malachi appreciated Dr. Warren’s services because he treated Malachi in the comfort of his own bed! “My Micropen treatment helped my acne scars & made my pores smaller!” – Gail J.